Polysingularity is a practice of belonging to several communities, forging random encounters, and exploring new social circles. Below we will demonstrate the current predicament using the example of real Facebook networks and then show how the practice of social polysingularity can improve it. Every community can be represented as a network. The nodes are the people and their interactions are the connections between them. The path between any two nodes are the steps we need to take in order to reach from one node to the other (e.g. if Jack knows John and John knows Alice who knows Mary, then the path from Jack to Mary is Jack -> John -> Alice -> Mary). It is a well-known and scientifically proven fact that most social networks have small-world structure. That is, while our friends, family and co-workers tend to be organized in distinct groups, it’s still relatively easy to reach from one node to another (in other words, such networks have low average path length and short diameter). The links within the communities are quite dense and are constantly reiterated through continuous interaction and frequent encounters. The links between the communities are often weaker, however, it’s exactly these links, which allow global communication. 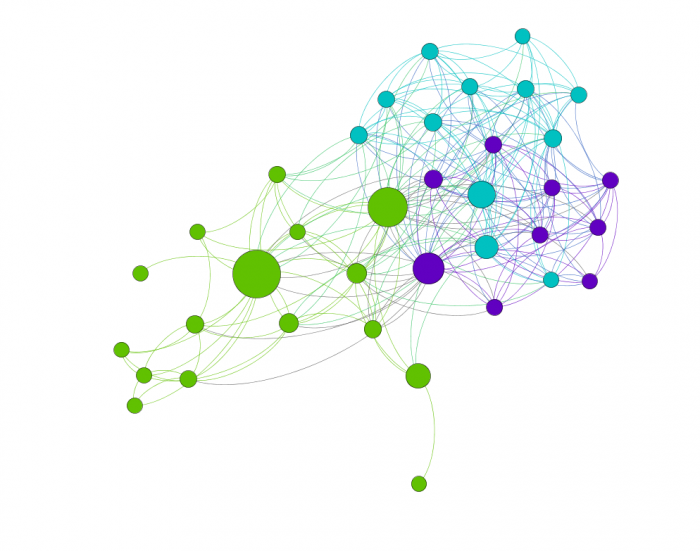 The notion of “weak ties” is very important in sociology, as it demonstrates how such connections enable interaction across sparsely connected groups. Also, global hubs play an important role in connecting different communities together. 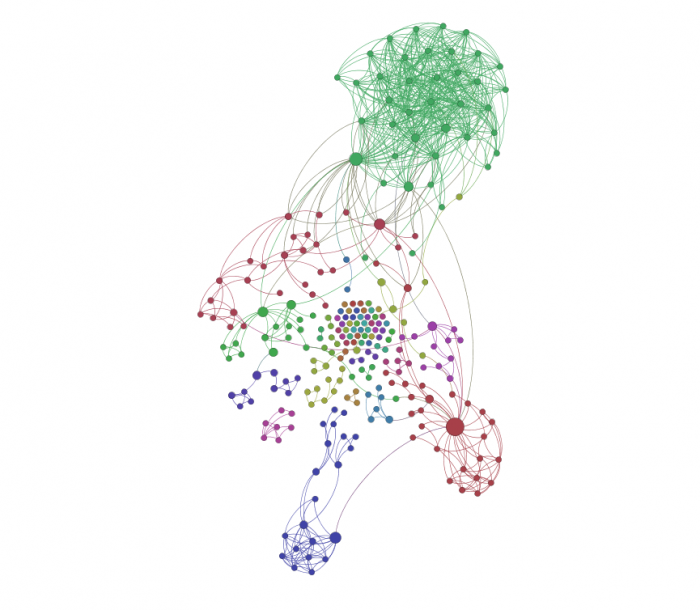 These are often the nodes with a high measure of betweenness centrality: the ones that appear most often on the shortest path between any two random nodes in the network. Small world networks are known for their capacity to synchronize easily and to maintain local areas of non-equilibrium stability within the distinct communities they are comprised of. The problem, however, is that most of our social encounters are small-world only structurally. If we take the frequency and intensity of interactions into account, the structure of our social networks may be very different. They might still be formally within the small-world category, but the connectivity and their ability to synchronize may either be disproportionally increased or decreased, depending on the structure. For example, it is often the case that we only interact with a small number of closest friends who all know each other. This tendency is further intensified by the algorithms embedded into the social media tools we use, leading to the creation of “filter bubbles”. We only have those people who have the same opinion as us on the most issues and avoid communicating with those who might think differently. The resulting network structure is such that most of the people have more or less the same number of connections, and then there are only a few who have a lot more connections and only a few who have less. Such network is called random and it is easy to find consensus in such structure, however, it’s hard to enter it. Densely connected network where there are no different distinct communities also excludes any possibility for offering a different point of view. Moreover, such structure may even become authoritarian in its insistence that the world is structured in a certain way, and there are no structural holes in such network, which, in turn, stifles its innovative potential. Random network structures are also often encountered on organizational level, within small workgroups, corporations, sects, universities, communes etc. The Facebook network below belongs to an individual who has a very densely connected community of friends and may sometimes find it too claustrophobic and restricting for his personal change. Another extreme are the kind of networks where community structure is too prominent and these different communities that are disconnected. For instance, this is the case where you have several groups of friends that do not relate to one another, or when you have to lead different lives having to put on a mask each time you enter into a certain community. Lack of global synchronization among the different groups put a lot of social pressure on the individual who is positioned within such networks. Moreover, such disparate structure ensures that there is almost no transformation of the network at large, so while it’s easier than in random networks for new members to join, it’s much harder for them to be integrated into the global structure. 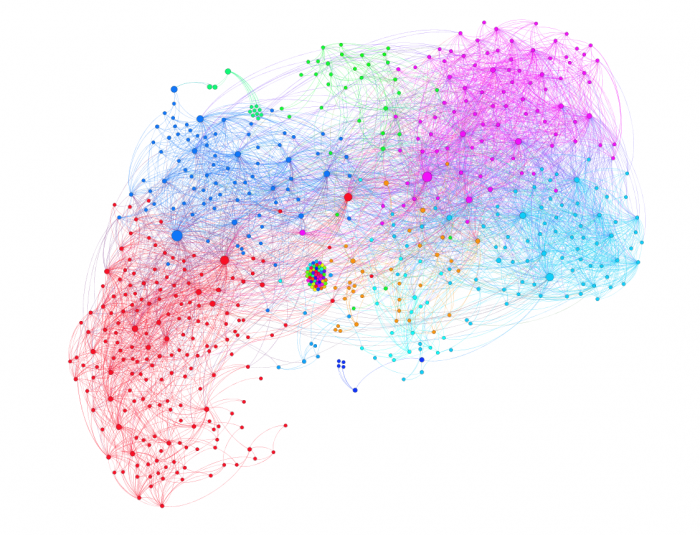 The Facebook networks below belongs to the individuals who are very active socially. However, they may often finds themselves having to put on a different persona depending on the community they are in and it also may be difficult for this person to integrate all the different input he is receiving and to feel socially supported in his endeavours. Such structure may lead to alienation or to promiscuity, if it’s taken to the extreme, as the groups are too isolated from one another. Polysingularity of social relations is a practice of oscillating between the extremes outlined above. On one side, it’s a practice of immersing oneself into different communities, which are separated from the rest of one’s network (as in the latter example). On the other side, it’s a practice of forging random links between these communities to allow for the global synchronization to emerge. The resulting structure will be that of the small-world network, where distinct communities exist with a relatively high number of random shortcuts between them. It is also important to ensure the constant transformation of community structure within polysingular network, closing the existing “structural holes” and forming the new ones. This practice will allow for continuous innovation and will also help the network, the communities, and the individuals that it is comprised of to continuously evolve and reinvent themselves. 1. Identifying distinct communities in one’s network and making sure that they are all given more or less equal priority over a period of time. 2. Forging links between these communities by introducing their members to one another. 3. Actively searching for new people, being open to the social circles they are willing to share with you, making new introductions, immersing oneself into the new scenes and contexts. 4. Making sure to stay out of the “filter bubble” and to also interact with those who don’t belong to the immediate circle of friends. 5. Avoid consensus, seek discord. 6. Accept various points of view, while being able to insist on a specific one even knowing that it might be “wrong” (informed naivety). 7. Practicing inclusive exclusivity: constantly re-integrating the periphery and re-excluding the central nodes, to allow for the constant renewal of influence distribution within one’s network. 8. Spending prolonged periods of time on one’s own and then also spending all the time together with other people. 9. Belonging to all sides, one at a time. 10. Being able to commit to a person or a group, while knowing that anything can change at any moment. The resulting structure would be a small-world network, where the nodes comprising it constantly change their positions across the communities and where the importance of each node is constantly renegotiated. 1. Split up in groups randomly. Each group finds a common condition (this can be a way of sitting, a subject for a conversation that everyone is engaged in, a position in the space that is occupied – anything). After 5 minutes every member is allowed to leave their group and join a different one. Once a member has left, the group is waiting for someone new to arrive before the next person can leave. Once a member arrived to a group, someone else should leave from it. Reiterate. Notice what happens. Share the experience. 2. Everyone is sitting in silence trying to be as still as possible. We are experiencing polysingularity of the social. Notice the subtle differences in people’s postures, face expressions, positions, breath, little movements. Observe how your state is changing and how the state of the group is changing. See if you can affect the state of the group in a subtle way. Observe how you are being affected. What are you as a group? Is it a combination of irreconcilable differences or is it a common entity? 3. Next time you’re walking on the street, observe people. Find someone interesting. Say hello. Ask them anything that relates to the current situation (what language they are speaking, where are they going, how do they feel, what’s happening in their life, etc.) Follow the impulse and talk to the strangers. Expand your social circle. 4. Spend a few days on your own. Tell everyone you left the city and observe the change that happens. 5. Think of the people you normally interact with. Map them out as a network. 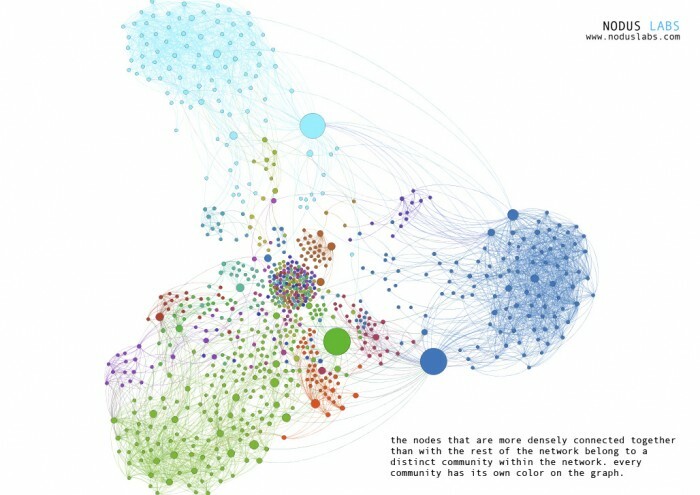 Notice what the structure of the network is, who is the most central, who is at the periphery. What kind of network do you belong to? Do all the people know each other? Is everyone too separated? How could you change the structure of the network? What happens if you introduce several groups of friends to each other? What if you limit your interactions with one group for a while? What if you explore that new friend you made a few days ago? 6. Next time you’re at a party, observe the constellations that people make. Normally it’s loners, pairs, and groups of 3 to 5 people. Try to navigate through the space, approaching the different groups. See how it makes you feel differently if you’re next to someone who is alone or if you’re next to a group.  Archived in Pre~liminaries. Bookmark the permalink.